Say goodbye to neck strain with this stretchy neoprene camera neck strap. Great value and incredible comfort. This comfortable strap features a wide elastic shoulder pad to stop the weight of the camera jarring your neck and shoulders as you walk. Two quick release (but very secure) catches allow the main strap to be removed. 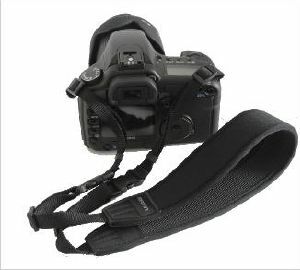 The two short straps which remain attached to the camera can then be clipped together to provide a short carrying handle. Supplied in black. Unbranded. 3rd I have bought they are very good. First class product. Comfortable, strong and easy to disconnect the main strap when using a tripod etc. Far better than the Canon strap which is terribly uncomfortable to use.